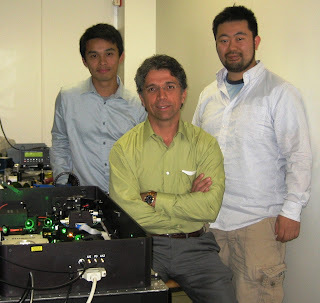 Affiliation: Photonics Laboratory, Department of Electrical Engineering, University of California, Los Angeles. Continuous real-time imaging technology with high temporal resolution is required for studying rapid dynamical phenomena such as shockwaves, chemical dynamics in living cells, neural activity, laser surgery, and microfluidics. However, traditional electronic image sensors such as CCD and CMOS cameras are unable to capture such processes with high sensitivity and resolution. This is partly due to the technological limitation that it takes time to read out the data from the sensor array, and also due to the fundamental trade-off between speed and sensitivity; at high frame rates, fewer photons are collected during each frame – a predicament that affects virtually all optical imaging systems. "Beating the Quantum Limit in Gravitational Wave Detectors"
To overcome these limitations, we have proposed and demonstrated a new type of imaging technique that offers at least 1000 times higher frame rates than traditional electronic image sensors such as CCDs . This imaging method, which we refer to as serial time-encoded amplified imaging or microscopy (STEAM), is an extension of our ultrafast 1D imager . It maps the 2D image of an object into a serial time-domain data stream and simultaneously amplifies the image in the optical domain using the technique known as amplified dispersive Fourier transformation. It captures the 2D image, not with a CCD camera, but with a single-pixel photodiode. The main attributes of the STEAM camera are the optical image amplification and the elimination of the CCD. When combined, it achieves continuous real-time imaging at a record frame rate of more than 6 MHz and a shutter speed of 440 ps. Achieving an image gain of 25 dB, the STEAM camera overcomes the fundamental trade-off between speed and sensitivity without having to resort to cooling and high-intensity illumination. The STEAM camera operates continuously and can capture ultrafast dynamical processes without any knowledge of the timing of their occurrence. Movie 1: Animated movie that illustrates the functionality of the STEAM camera. The details of the STEAM camera’s operation are shown in Movie 1. A broadband pulse is dispersed and separated by a pair of dispersive elements consisting of a virtually-imaged phased array and a diffraction grating to produce a 2D rainbow. When this is incident onto the object, the spatial coordinates of the object are encoded into the spectrum of the back-reflected 2D rainbow. The key innovation is what happens next. The reflected pulse is directed toward an amplified dispersive Fourier transformer which maps the image-encoded spectrum into a 1D temporal data stream, and simultaneously amplifies the image using distributed Raman amplification. The optically amplified 1D serial data is detected by a single-pixel photodiode and digitized by a real-time oscilloscope. The 2D image of the object is reconstructed by folding the 1D vector into a 2D matrix, representing the 2D image, in the digital domain. The image amplifier in the STEAM camera is different from so-called image intensifiers. In the STEAM camera, amplification occurs in the optical domain as opposed to in the electronic domain in image intensifiers. Image intensifiers are complex devices and have a low image acquisition rate up to ~10 kHz in continuous mode – performance that is adequate for its intended use in night-vision cameras because they only need to operate at the video rate. The limited frame rate is due to the fundamental trade-off between gain and bandwidth in all electronic systems, including the image intensifier. In scientific applications, high-speed imaging is often achieved with the time-resolved pump-probe technique . Pump-probe techniques can capture the dynamics of fast events, but only if the event is repetitive. Because they do not operate in real time, they are unable to capture non-repetitive random events that occur only once or do not occur at regular intervals such as rogue events . Detection of such events requires an imaging technology with fast, continuous, and real-time capability. Another type of high-speed image sensor is the framing streak camera that has been employed for diagnostics in laser fusion, plasma radiation and combustion. This device operates in burst mode only (providing only several frames) and requires synchronization of the camera with the event to be captured, rendering streak cameras also unable to capture unknown or random events. This, along with the high cost of the camera, limits its use in practical applications. Continuous real-time images of the laser ablation experiment. Continuous real-time images captured by the STEAM camera with a temporal resolution of 163 ns and shutter speed of 440 ps. The changes in sample surface reflectivity due to the laser-induced mass ejection are evident after the ablation pulse hits the sample at t = 0 ns. To demonstrate the STEAM camera’s ultrafast real-time imaging capability and utility, we have used it to successfully capture the dynamics of laser ablation. Laser ablation is a ubiquitous technology that is used in laser surgery, laser cutting and micromachining, and laser-induced breakdown spectroscopy. The ablation was performed with a mid-infrared pulse with 5 ns pulse width focused at an angle onto a sample consisting of a bilayer of aluminum and silicon dioxide deposited on top of a silicon-on-insulator substrate. The imaging pulse train of the STEAM camera was incident to the surface of the sample at a normal angle. Figure 2 shows the real-time sequence of the images with a frame repetition period of 163 ns. The entire frame sequence corresponding to the dynamics (laser-induced mass ejection) caused by the single ablation pulse was captured in real time. “Serial time-encoded amplified imaging for real-time observation of fast dynamic phenomena", K. Goda, K. K. Tsia, and B. Jalali, Nature 458, 1145 (2009). Abstract. “Amplified dispersive Fourier-transform imaging for ultrafast displacement sensing and barcode reading”, K. Goda, K. K. Tsia, and B. Jalali, Applied Physics Letters 93, 131109 (2008). Abstract. Nature Physics 2, 415 (2008). Abstract. Nature 450, 1054 (2007). Abstract.